If you’re looking for replacement coils for your Nautilus tank, we can help you to find exactly what you need, here at Official Aspire. This section also covers the whole Nautilus series of tanks and coils from Aspire, including the legendary Mini Nautilus, which is still arguably one of the best vaping and flavour tanks on the market. In addition to the tanks, we have also placed the compatible coils in this section for quick, easy navigation. 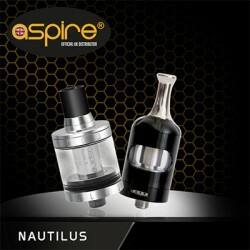 The Nautilus tank series are innovatively designed and use the latest Aspire technology. When it comes to setting up the tank, you can rest assured that it’s simple enough. The tank has smooth, rounded lines, which make a change from the straight edges that other brands use. Each component of the Nautilus tank is designed to fit together perfectly and reduce the chance of the e liquid leaking. Our Aspire tanks can incorporate both bottom-filling systems or top filling, which is great for eliminating spillages. Stand the tank up to fill with e-liquid, then secure the seals and you’re good to go! The Aspire Mini Nautilus is a smaller legendary version of the Nautilus tanks – providing mouth to lung vaping. It is also still one of the best-selling tanks for distributors, up and down the country, as it guarantees longevity and produces magnificent flavours and vapour. This Nautilus tank is made from Pyrex glass and has a 2ml capacity, alongside valuable airflow control which can easily be adjusted to suit vaping needs. Here at Official Aspire, we supply a wide range of Aspire Nautilus coils which are compatible with various Aspire tanks. Coils are used to power e cigarettes and ensure that they perform reliably. When it comes to choosing replacement Nautilus coils, you can rest assured that you’re in capable hands with Official Aspire. We provide a selection of new coils, all of which have been purposely made to enhance your vaping experience. The Aspire Nautilus coils were the first of their kind, to use a bottom vertical coil. They are designed to provide great quality and longevity and can also improve the taste of your e juice. The BVC coils are suitable for the Nautilus and Nautilus Mini and are supplied in packs of 5 in many resistances such as 0.7ohm, 1.6ohm, 1.8ohm etc. Keep your stock up to date with essential replacement Aspire Nautilus coils and tanks today – call us on 0333 577 5002. Aspire Nautilus 2S Presenting the all new Aspire Nautilus 2S the ultimate mouth to lung tank / hy..